Summary: To date, vertebral venous valves have not been studied clinically or by sonography. This report reveals that these valves could be studied noninvasively by using sonographic techniques. Real-time sonography clearly showed the opening and closing of the two cusps of vertebral venous valves at the junction of the vertebral vein and the brachiocephalic vein, which move synchronously with the internal jugular venous valves. This is the first time the vertebral venous valves have been studied by using clinical sonography. This might provide a new point of view for evaluating the clinical significance of vertebral venous valves. This study reports the detection of vertebral venous valves by using noninvasive, real-time, pulsed Doppler and M-mode sonographic techniques. Valves present in the vertebral veins have been described in major anatomy textbooks (1). Like the internal jugular veins (IJV), the vertebral veins serve as important venous vessels for blood returning from the brain (2). The presence and clinical significance of the competent jugular venous valves have been reported and discussed in the literature, but many physicians are unaware of the presence of the valves in the vertebral veins. Gray’s Anatomy (1) describes how the vertebral veins collect the blood, go through the first to sixth transverse cervical foramina, and finally descend to open superoposteriorly into the brachiocephalic vein. The opening of the vertebral vein has a paired valve. The clinical significance of the vertebral venous valves has not been studied. In October 2000, one healthy male and one healthy female patient displayed the vertebral venous valves in our neurovascular laboratory. Later, one female patient with tension-type headache and one female patient with migraine-type headache related to menstruation were referred to our laboratory to study the valvular competence of IJV. None of the study participants experienced headache during the examination, and none had taken medication for at least 2 weeks before the examination. No evidence of increased central venous pressure or congestive heart failure was observed. The ages of these four participants ranged from 26 to 36 years. All the participants signed informed consent. All four patients were examined in the supine position by a computed sonography system (ATL sonography; HDI 5000, Bothell, WA,) with an L12–5 broadband linear array probe, which has B-mode, real-time, pulsed Doppler and M-mode capabilities. The duplex probe was placed above the clavicle and angled downward to visualize the IJV and vertebral vein near their openings to the inferior jugular bulb and brachiocephalic vein, respectively. The B-mode, real-time component was used to localize and record the valves. Pulsed Doppler recordings were made cephalad to, in the area of, and caudad to the valves. M-mode recordings were made in the valve area, to follow the valve motion. The opening and closing of the valves was easily visualized with real-time recordings (Fig 1) in all four study participants, and there was no difference in the motion of the valves between the healthy participants and those with histories of headache. We could visualize the two cusps of the valves at the opening of the vertebral vein into the brachiocephalic vein. Figure 2 displays the serial changes of the opening and closing process of the vertebral venous valves. 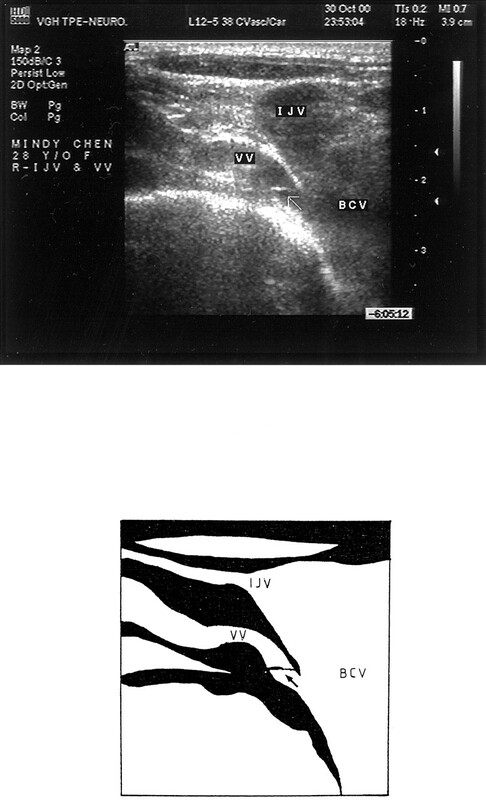 The motion of the vertebral venous valves was also recorded by M-mode (Fig 3), and the IJV valves were recorded simultaneously. We found that the opening and closing of the vertebral venous valves is synchronized with the IJV valves. Right vertebral venous valves (arrow) can be seen at the junction of the IJV, vertebral vein (VV), and brachiocephalic vein (BCV) under the B-mode image. B-mode, real-time imaging with color Doppler recording of vertebral venous valve’s opening and closing. VV, vertebral vein. A, During early opening phase. M-mode recording of both the internal jugular venous valve and vertebral venous valve. Arrow 1, valve opening; arrow 2, valve closing; VV, vertebral vein; BCV, brachiocephalic vein. The vertebral venous valves have received little attention in the medical literature. To the best of our knowledge, our report is the first imaging study to assess the vertebral venous valves by using clinical sonography. The B-mode recording of our results revealed that there was a two-cusped valve (in all four cases) located at the opening of the vertebral vein into the brachiocephalic vein. The M-mode recording revealed that the valves open and close simultaneously with the jugular valves. During each cardiac cycle, the IJV valves close once fully. During diastole, IJV valve closure occurs, while the atrial kick transmits backward pressure from the right atrium into the superior vena cava and then into the brachiocephalic vein and the IJV (3). We observed the same process happening for the vertebral venous valves. The synchronization of valvular motion between jugular and vertebral valves is a reasonable finding, because the hemodynamic changes are the same. The clinical importance of the vertebral venous valves may be its role as an incompetent valve related to an increase of intracranial pressure, similar to the incompetence of the IJV valves (4). Like incompetent IJV valves, incompetent vertebral venous valves might also cause backflow of blood to the brain and increase the intracranial pressure in the case of increased intrathoracic pressure from positive end-expiratory pressure administration, cough, chest wall compression, or abdominal wall compression (3–5). At the same time, the functional or morphologic incompetence or absence of either the IJV valves or the vertebral venous valves may be the cause of cough headache, cerebral morbidity after positive end-expiratory pressure ventilation, and some types of cerebrovascular diseases (4). The competency of the IJV valves and cardiac valves cannot be determined by M-mode recordings because of the limitations of this technique (3). This same problem occurred in evaluating the vertebral venous valves. This is because the M-mode recording can record only one point of valvular surface at a time. The competence of the valves can be determined only by recording the entire surface of the valve, but there are infinite points on the valvular surface, so it is not possible to use M-mode recordings to determine valvular competency. The competence of the IJV valves can be assessed by using the internal jugular venography, color-flow imaging, and air contrast sonographic venography (5). Because the physiological condition of the vertebral venous valves and the IJV valves are nearly the same, it is reasonable to use these same methods to evaluate the competence of the vertebral venous valves. Further studies are needed to confirm these methodologies. 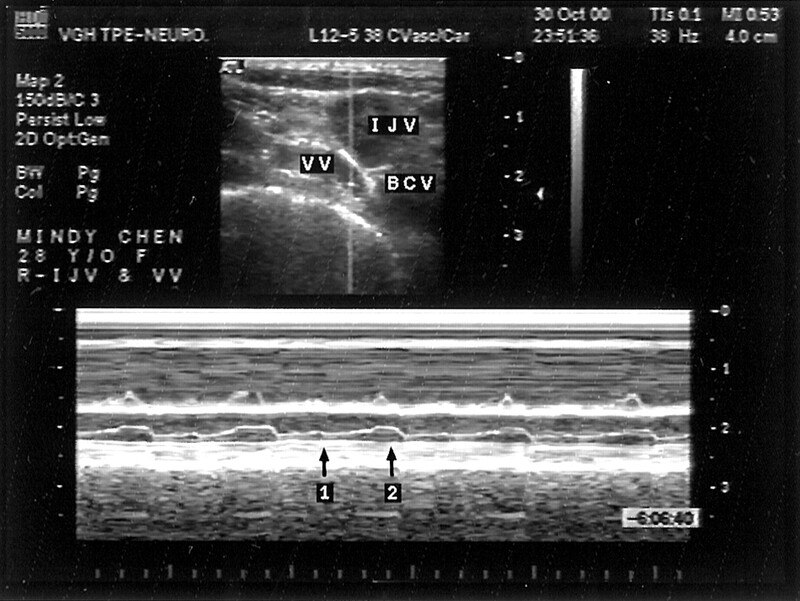 Motions of the vertebral venous valves were easily shown by using B-mode, real-time, pulsed Doppler and M-mode techniques. Our findings challenge the general thought that the IJV valve is the only protective venous vessel valve between the heart and the brain (5). These findings also suggest that a more thorough evaluation of the clinical significance of the vertebral venous valves is needed, especially regarding its role in the increase of intracranial pressure. We thank our colleagues at the Neurological Institute in Taipei Veterans General Hospital for technical assistance, and we thank the sisters and the brothers of the Christian Fellowship in the Taipei Veterans General Hospital for voluntarily undergoing ultrasonic examination. Accepted after revision April 15, 2002.